It’s warm outide but I’m not sure what happened to the sun? 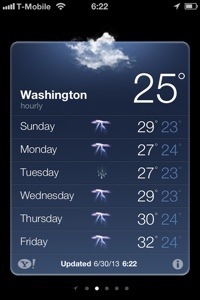 The rain and thunderstorms have been hanging over DC since I got back, and will continue to do so for the better part of next week according to the weather forecast. Since I’m still working for a few more days, it’s alright. Today I’m off, though, and I’m going to Union Market with Swedish Monika. Hope you all have a nice weekend too, sun or no sun! This entry was posted in Posts From Washington DC and tagged Summer. Bookmark the permalink.